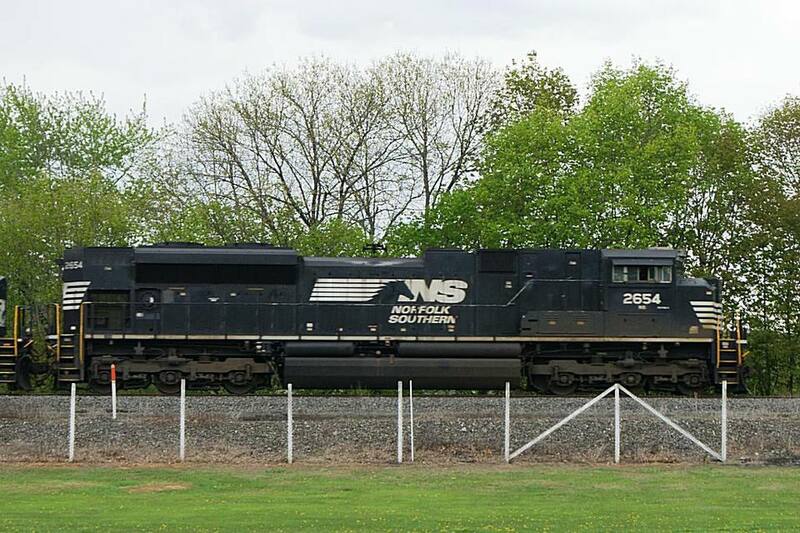 A Norfolk Southern SD70M-2 working as designed - on the point of a priority stack train. ©2015 Ryan C Kunkle, licensed to About.com, Inc. The SD70M-2, compared to the SD70ACe, shows how popular AC power has become. This DC locomotive has sold only a fraction of its modern AC sibling. The SD70M-2 grew out of the need for EMD to comply with new Tier II emissions requirements in the United States. While the internal refinements from the preceding SD70M were relatively minor, the locomotive emerged with a new frame and carbody. Although a completely separate program from the -2 upgrades of the 1970s, the SD70M-2 is similarly an improved version of the SD70M. Since the introduction of these locomotives, GM has sold EMD. The builder is now part of Progress Rail. The appearance of the locomotives has not changed beyond the builder's plate. The SD70M-2's biggest competition is the General Electric ES44DC. GE's "Evolution" model has outpaced the SD70M-2 in sales and, with a Tier 4 replacement not planned from Progress Rail until 2017, GE is poised to extend that lead. When the SD70 line was first introduced in the early 1990s, AC traction motors were something of a novelty. Sales of the SD70 and SD70M compared favorably with the SD70MAC. With just 331 SD70M-2s compared to more than 1100 SD70ACe's it is clear that the AC motor is here to stay. Canadian National and Norfolk Southern operate the largest fleets of the locomotives by far. Florida East Coast leased 11 SD70M-2s but in 2015 began taking delivery of new GE locomotives - a first for the long-time EMD railroad. Traditionally AC locomotives tend to work slower "drag" freights like coal trains, with DC units assigned to faster freights. SD70M-2s tend to be assigned to intermodal and mixed freight trains. Heavy growth in coal and unit oil and ethanol traffic over the past decade helps to explain the shift toward AC power. The locomotives do wander to different trains however and frequently interchange from one railroad to another. This "foreign power" helps to create some colorful consists in an era when the locomotives themselves look more and more alike across all roads. With new emissions standards about to take effect, it is highly unlikely any more SD70M-2s will be built - at least for North American service. As of 2015, a successor is still in the design phase. Nevertheless, as long as it proves as reliable as those that came before, it seems the SD70M-2 will be around for many years to come. Although not a very popular model with the prototype, because it can be modeled with only a few relatively easy detail / tooling changes, several manufacturers who have done an SD70ACe have also produced an SD70M-2. The list of models below is specific to just the SD70M-2 itself. SD70ACe's would be a logical starting point for a kitbash in other scales or could simply be used as a stand in.